March was a huge month for women’s empowerment in Manila. First, on March 15, seven women graduated from the Golden Hands Livelihood program’s 2018-19 Sewing and Pattern Making Class. This course started in June 2018 and the women persevered for eight months of weekly training sessions in Makati City to qualify for graduation. Then, a week later, another 13 women graduated from ER’s Sewing and Pattern Making Class held through ER’s Pathway For Hope program in a nearby village. Click here to read about Pathway for Hope’s graduates. The Golden Hands and Pathway For Hope programs represent a shrewd investment in the futures of the 20 women. Most all of the women are from struggling communities where families scrape by, often selling products on the street to survive. Without educations, the families have little hope of escaping this generational cycle. That why the Golden Hands Livelihood program was launched. Learning sewing and seamstress techniques provides the women with bankable skills that can be used again and again to generate income. In addition to the sewing skills, women are taught basic business and life skills. The seven Golden Hands grads proudly walked forward to receive their certificates while accompanied by the Philippines graduation march song. They were teary-eyed as they gave their testimonies of how Golden Hands changed their lives and how grateful they are for the patience and love of their teachers in helping them learn the multi skills they have acquired through the program. Each faces were glowing and filled with so much joy as their names were being called out for their certificates of completion and as each received their bouquet, starter sewing kit and their most awaited award, the industrial sewing machine! But the most awaited part of the program was the catwalk – where the ladies showcased their own creation. It was a hilarious fashion show as they enjoyed walking and posing with pride. As I went home that afternoon, my heart was filled with joy and thanksgiving for another set of ladies who were empowered and went home taking with them not just their certificates, starter kits, and sewing machines, but they brought home with them new skills they will use to stop the generational poverty they have had for many years. With the new skills they have learned and with the sewing machines awarded to them they will be able to prove to themselves that they have the capacity to provide an income for their families that will make them feel their worth and dignity. Scroll below to learn more about the Golden Hands program. Click here to support ER’s Women’s Empowerment programs! May was a busy month. For the first time we launched a Summer Sewing Camp for girls aging 7-12 years old. Nine girls attended a two-days-a-week class from 9 a.m.-5 p.m. for eight sessions. The girls learned hand sewing, basic stitches and how to use a portable sewing machine. They were able to sew tote bags and skirts which they paraded during their fashion show on their graduation day. We held a ceremony for the girls who were so excited and proudly shared and paraded to their accomplishments before their parents. Each girl received a sewing kit for children as an award. After the graduation celebration, everyone went home happy and fulfilled – especially the teachers. During the four weeks of training we learned to love these girls and patiently taught them even when they were noisy. Their passion for learning sewing skills motivated us to teach them patiently. Beyond teaching skills, the greatest fulfillment for us was the opportunity to share about how to encourage each other, apologize for antagonizing comments and to ask for forgiveness. It was a month of learning, not just for the kids, but for us their teachers as well. Scroll below to read more about the Golden Hands Livelihood Educational Program operated by the staff of ER Asia in greater Manila. On March 16, Golden Hands held a graduation ceremony for our third Basic and Pattern Making Class. It was the much awaited moment for 10 trainees who worked hard and faithfully for eight months. After 32 weeks of training, the they finally received their highly anticipated rewards: certificates of completion, starter kits and an unannounced industrial sewing machine. With tears in their eyes, they were filled with joy and excitement as they received the fruits of their labor! There is always something different and special during each Golden Hands graduation. As in 2017, the 10 women who graduated this year paraded their final creations on a red carpet. But this time they were more sophisticated and creative. The dresses the women made for their graduation ended up being fit for a wedding event. So we dubbed their fashion show as “Wedding of the Century”. Visitors, family and friends of the graduates were all amazed at the beauty of their final creations. Everyone enjoyed watching them parading their dresses with grace and class. The funniest part was when the audience saw one women wear an actual wedding gown. She was a senior citizen, 63 years of age! Then they understood why the fashion show was themed “Wedding of the Century”. But what made this graduation extra special was the moment when the graduates saw the surprise award, which we kept hidden from them for eight months. With eyes closed, they were led to the Golden Hand’s sewing room. When they opened their eyes they were all surprised with what they saw – 10 industrial sewing machines! They were teary eyed and shouting for joy. We ended the graduation ceremony with the 10 trainees making a covenant that they will take good care of their sewing machines, enhance their acquired skills, use them to help lift their families from poverty and be committed to promote the cause of Golden Hands. Looking at the new and former graduates who were present at the graduation, I felt like a mother who is so proud with the accomplishments of her children. My heart was filled with joy and gratitude for what Golden Hands had become, how it has empowered these women by giving them a sense of worth, building their self-confidence, making them feel they belong to a community that cares for them and giving them a sense of dignity. Thank you for helping Golden Hands fulfill its dreams and vision in helping change the lives of these women living in extreme situation. Click here to support ER’s Women’s Empowerment programs! ugh skills development and entrepreneurialism. Program participants live in metro Manila. This support will allow program participants to develop self-confidence, build relationships and help support their families. It’s this type of generous compassion that allows ER to help change the lives of people who were once hopeless. Thank you to all of our new donors for your support! 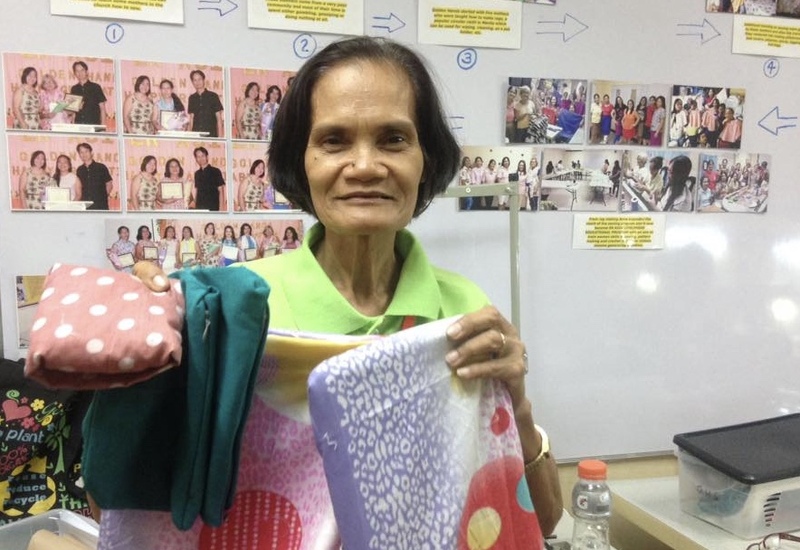 ER Asia has been pouring into at-risk women by teaching sewing, embroidery and business acumen. Last month, the program graduated its most recent class. Congratulations to all the women for their hard work and new skills. ER Asia’s desire to help women began in 2012, when a group of mothers and women from a small community of poor informal settlements in Makati City decided to meet on a regular basis. Their purpose is to spend productive time learning more skills. This group led to the formation of the Golden Hands Sewing group, which evolved into the Golden Hands Livelihood Educational Program one year later. We had to change the name because the program was accomplishing far more than teaching sewing skills. The Golden Hands program is designed to lift women out of poverty by providing livelihood skills, coaching and a supportive group environment. The program relies on generosity of ER supporters in order to provide the classes, materials and sewing machines. Learn more about this life-changing program here. We love sharing updates from ER Asia’s Golden Hands Livelihood Educational Program. Each year, several women apply to participate in this program, which teaches sewing and embroidery skills, business development, teamwork and life skills. Equally important, the women gain positive self-images and the confidence to launch small businesses. This helps their families become sustainable and climb out of poverty. training. The ladies made pin cushions, pillow cases and miniature bed covers. Golden Hands is one of many programs ER and our partner operate in order to help empower women. We understand that often women absorb the burden of poverty. Helping them gain skills allows entire families to prosper. Scroll below to learn more about Golden Hands. For many women living in high-poverty conditions, getting dressed up and celebrating at a graduation ceremony is nothing more than a dream. The dream came true for seven women working with Extreme Response Asia’s Golden Hands Livelihood Educational Program. ER Partner Batang Matinik hosted the second graduation of Golden Hands Basic Sewing and Pattern Making Course in Tiaong, Quezon, Philippines on March 3, 2017. After seven and a half months of training, the seven “boutique ladies” graduated with pride as they paraded their final works of creation — their dresses — on a catwalk. They enjoyed the raucous cheers of the other students and supporters. 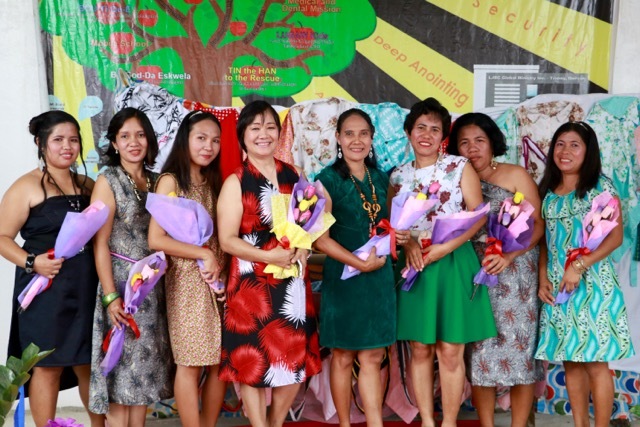 The boutique ladies graduated after months of faithfully coming to the Batang Matinik Training Center every Friday for their Basic Sewing and Pattern Making Course. The ladies demonstrated great excitement on graduation day where they finally finished their course and received the fruit of their labors – surprise awards and gifts. The week before the graduation day, the ladies were busy designing and sewing their own dresses for the graduation. They worked on their final project on their own without their teachers’ assistance. They had to apply everything they learned in the seven months of training. Lo and behold, they exceeded their teachers’ expectation! Read about Sally (at right), one of the Golden Hands graduates, here. The day before the graduation with the assistance of Marlyn, the team leader of Batang Matinik, the seven ladies nervously practiced how they will walk with grace and beauty during their catwalk. It was their first time to do this that’s why they had a hard time practicing but they did it anyway with so much fun and laughter! The graduation day was filled with mixed emotions. It was sad because we no longer will have weekly meetings like we had during our training days and will surely miss these ladies and their exuberance. Their life stories made us teary-eyed as we listened to how grateful they were. They also touched our hearts with their commitment to nurture their skills and use them to help provide for their families. Yet, at the same time, we were filled with joy and laughter as we watched these ladies gracefully and proudly parade the dresses they made on the catwalk. These ladies surprised me a lot as their teacher. I was really amazed on how they beautifully designed their dresses. It made me proud of them knowing our labors in traveling back and forth every week for seven months were never in vain. To all the boutique ladies, congratulations! The Golden Hands program is designed to lift women out of poverty by providing livelihood skills, coaching and a supportive group environment. The program relies on generosity of ER supporters in order to provide the classes, materials and sewing machines. Interested in supporting this life-changing program? Click here. Like caterpillars emerging as beautiful butterflies from their cocoons, eight members of the Golden Hands Livelihood Education Program celebrated being the program’s very first graduates. Each of the women wore dresses they made themselves and enjoyed a time of recognition, glamour and thankfulness. conditions and a lack of opportunity. Two years ago, none of them would have envisioned themselves being celebrated. They had little hope that their lives would improve. But today, in a fancy ceremony that involved flowers, photos and the presentation of new sewing machines as graduation gifts, the women were honored for their achievements. So what caused the transformation to take place? The short answer is that people cared. Extreme Response Asia staff members saw the needs and became determined to find a way to encourage, inspire and equip these women to strive for better lives. We saw the potential in the women, even though many of the women could not yet see it in themselves. Our desire to help the women led to the formation of the Golden Hands Sewing group, which evolved into the Golden Hands Livelihood Educational Program a year later. We had to change the name because the program was accomplishing far more than teaching sewing skills. For one, the women were discovering self-respect and confidence. For another, they were growing trusted new relationships. They also were learning life skills, business skills and spiritual depth. They were becoming well-rounded people, filled with hope and grace. So that’s why celebrating the graduation of eight women from the Golden Hands program was so big. It was so much more than certificates and gifts. We affirmed them in a very powerful way. eight months and finish all their assignments. They had to learn cutting, pattern making, basic sewing, crocheting and some knitting. Eight of 10 enrollees made it all the way through the program. As a special incentive, ER provided a sewing machine and starter kit for all eight graduates. Going forward, the women will receive continuous training and coaching. Most of them are planning to start businesses, including six who want to pool their capital, work as a team and share profits. During the last year, the women have built a lot of self-confidence, created a community among themselves and become closer than ever. They acquired skills that they say will not be taken away from them, that they will bring with them wherever they go. Even if they are forced to leave the places where they now live, they will bring skills that will provide livelihood wherever they relocate. They now have a weapon to fight poverty. Anne Benavidez is the director of the Golden Hands Livelihood Educational Program located in Makati City near Manila. Click here to learn more about the Golden Hands program. In today’s short-cut society, there are “life hacks” that teach us quick and easy ways to fix things. But when it comes to lives broken by poverty, abuse, abandonment, oppression, human trafficking and neglect, there are no short cuts, no simple hacks to make things better. Faced with huge challenges regarding the plight of women struggling with poverty and lack of hope in the Philippines, the ER Asia staff knew it had to use long-term, sustainable tools to help women and children, who often are marginalized in Filipino society. About four years ago, a group of mothers and women from a small community of poor informal settlements in Makati City decided to meet on a regular basis. Their purpose is to spend productive time learning more skills rather than hanging out with neighbors playing cards and chatting. Extreme Response Asia’s Golden Hands Livelihood Educational Program took the initiative to train, educate and organize the women, most of whom come from the informal settlements. The aim of the program is to empower and change the lives of women living in extreme and often life-threatening situations. Last year, program director Anne Benavidez developed a community-based curriculum for the group. They meet once a week for values formation and skills enhancement. They were taught how to do basic sewing and pattern making for skirts, swing bags, double-sided aprons and a whole lot more. During the training, the women developed not only their skills, but also self-confidence and trusted relationships. As a group of bonded women, we rejoice when we see that lives are being changed. Lorna Serano and Emily Abajar are examples of changed lives. Each has experienced abundant blessings and are enjoying the hope of freedom from poverty. Little by little, they are acquiring the skills and talents through the livelihood sewing program which they will use to meet their financial needs. Emily Abajar is now in the process of launching her own home-based alteration shop She said the skills training received through Golden Hands have given her the opportunity, confidence and knowledge on basic sewing and pattern making. She is excited and looking forward to the culminating ceremony on the April 1. She will be among the first women to graduate from the program. We at Extreme Response Asia are truly encouraged to see changed lives and empowered women in the community, thriving to overcome poverty, oppression and injustice in the society. Indeed every single day is a blessing, a spark of hope and an avenue for change. Pen “Pen Pen” Bullo serves at-risk communities in and around Manila as part of her duties with Extreme Response Asia.